Questions: See below for answers. 1. How do I set up a parent account and do I need one? 2. How do I add a student to my parent account? 3. How do I message my writing coach? 4. How do I turn in my assignment? 6 How do I take the quizzes? 7. What is the best way to reach out if I have a question not answered here? 8. How do I convert my Pages or Google Doc paper to a PDF file so I can submit it? 1. How do I set up a Parent (Observer) Account? 6. Logout of your student account (Account > logout). 7. Click the link in the upper-right corner. Fill out all fields. Paste the Pairing Code in the appropriate field. Note: Pairing Codes expire in 24 hours. 8. Fill out all fields. Paste the Pairing Code in the appropriate field. Click Start Participating. Note: Pairing Codes expire in 24 hours. HERE'S some more information about the role of Parent/Observer and different ways you can customize how you use Canvas. 2. How do I add students to my observer/parent account? HERE'S a quick guide to adding students to your account. Go to your Dashboard and click on the Inbox icon on the left side of the page. Once you’re in the Inbox, Click on the compose message icon at the top, near the middle of the page. When you have unread messages, you’ll see a notification number on the Inbox icon. IMPORTANT: You are only allowed to submit ONE paper per week. If you discover that you uploaded the wrong paper, you MUST get permission from your writing coach before uploading a different version. Your writing coach will evaluate the first paper you turn in UNLESS you ask permission to upload a different one. Papers must be submitted in one of the following formats: PDF, doc, or docx. Please note: Pages and Google Docs will not work. See question 8 to learn how to convert those document files into the right format. Login to your account. Go to your Dashboard. Click to enter your course. Click on the Assignment for this week. Click on the Submit Assignment button on the top right. Go to the bottom of the page. Click on Choose File. Find your file on your computer and click on it. Click the Submit Assignment button. 6. How do I take the quizzes? At the bottom of each lesson there is a Take the Quiz button. Click on that link. After clicking on that link, you’ll be taken to an instruction page, and at the bottom of that page is the quiz. After answering each question, click on the Next button. After you’ve completed the quiz, click on the Submit Quiz button on the bottom right. 7. What is the best way to get answers not provided here? Canvas Guides is a great place to learn about Canvas features. Canvas is a very powerful, innovative learning platform with many customizable features. Click on the link that describes your role on Canvas. You’ll either be a Student or an Observer. If you are using an Apple device and your paper is created using .pages, here’s how to convert it into a PDF. Once you have finished your paper, click on File>Export>PDF. If you are using Google drive, here’s how to save your work as PDF files. Once you are finished writing, click on File>Download as>PDF. 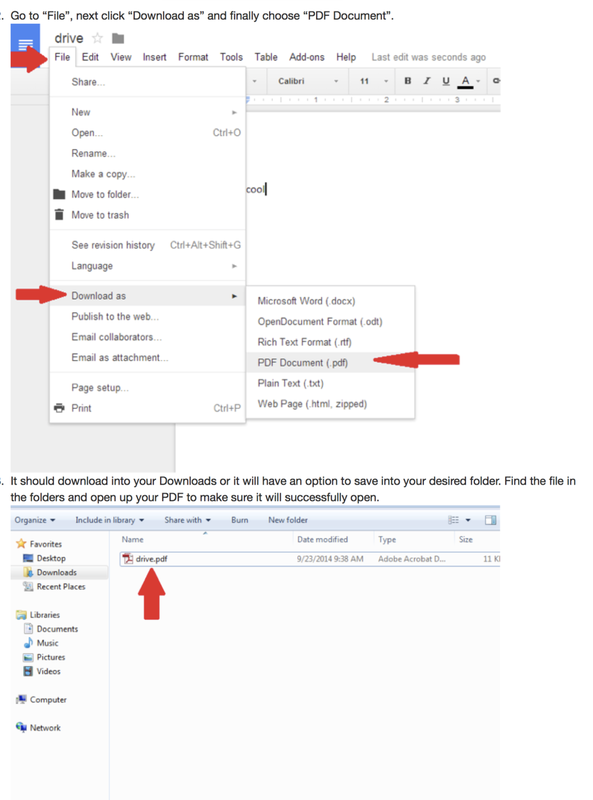 Your paper will either be saved in your Downloads, or you will be prompted to select where you want to save your file.